Call the cops. He copied! First published in The Guardian, 15 October, 2014. You can count on me Roy. Irrational arguments are my forte. Ask my wife. 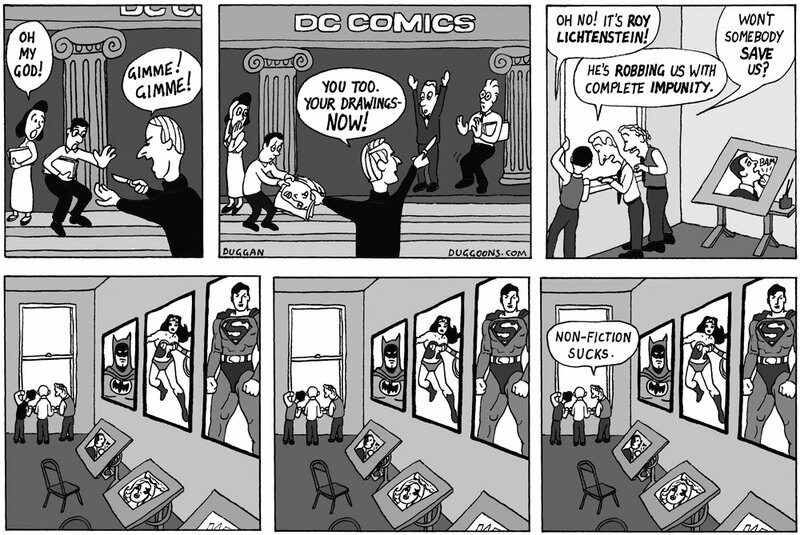 The majority of Lichtenstein’s cartoon appropriations were from cartoonists working for DC Comics. Actually, it’s a trickier issue than it seems, magnified, in this case, by extreme discrepancies of fame and wealth. Having worked on both sides of the painting/comics divide I am loathe to come down exclusively on one side or the other. On the art side I feel one should be as free as possible to do anything you want (for me that’s a fundamental premise of art – a zone in life where one is allowed complete mental freedom). However my natural sympathy is always for the person who has done the majority of the creative work – the thinking, the composing, the drawing. Obviously, in this case, the cartoonist. One slight defence of Lichtenstein is that today it is far more expected and accepted to seek permissions, acknowledge, and credit the “source’ artists, than it was in his. Anyway, make up your own mind. Three interesting links below. There is no doubt that Lichtenstein was a masterful designer – see the changes he made from his source material for his most famous painting here. 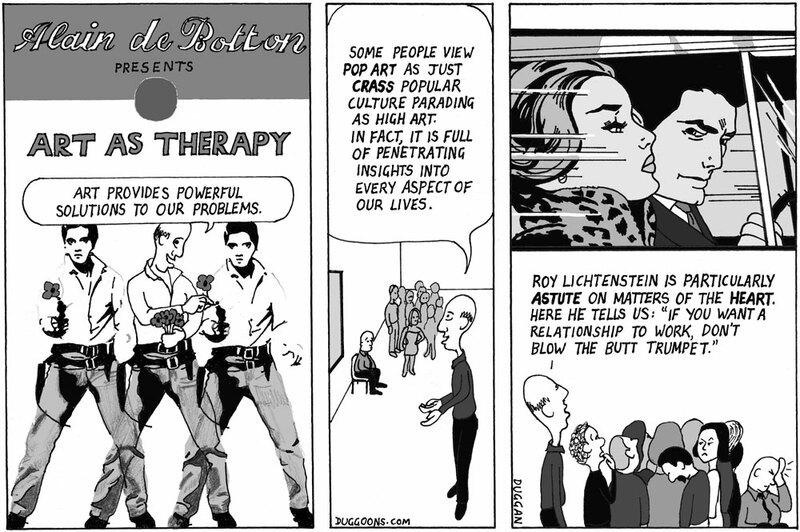 Here is how one of the cartoonists felt, in a strip drawn very recently. And here is a side-by-side list of Lichtenstein’s paintings with the cartoons from which they were derived. There you go – case closed. First published in The Guardian.com, 8 January 2014. I manufactured this cartoon the night before it was published. I was at work in my occasional day job when I received an email from the Guardian saying they didn’t want to use the cartoon I had proposed. My previous cartoon had been published on Christmas day, for which I had fabricated 2 Christmas themed cartoons. I liked them both so I submitted the second as my next one. “Er…”, said my editor “You know it’s not Christmas anymore.” This was a very good point, and very well made. So after finally getting my daughter to bed I frantically went through my notebooks and found this idea. I had been toying with it but had got stuck, thinking that the way forward was to find a married couple of famous pilots – not so easy. I now realised that the two people could be anonymous and it worked fine. A long night. The next day I went back to work, feeling quite unrefreshed. It may surprise you to hear that an internationally famous cartoonist like myself has a day job. I often go partying mid-week with Madonna, David Beckham, Steve Bell, Cheryl Cole and a bunch of others but I am not in their wage bracket so at a certain point I have to leave, saying that I have to get up for work in the morning. They are normally very nice about it, except for Sting, who sometimes says things like “I hope the batteries in your alarm clock don’t run out, you £*@% loser.” I laugh along of course, but, you know, these things hurt. I guess that’s why they call him Sting. There’s an exhibition here in London on Ice Age art at the incomparable British Museum. 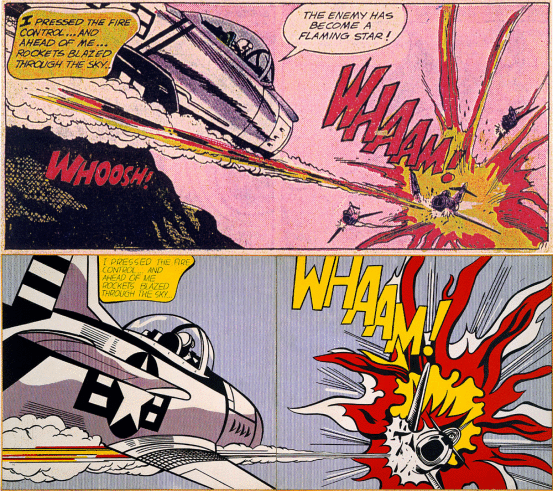 There was also, at the time of the cartoon’s publication, a retrospective of Roy Lichtenstein at Tate Modern. The two must have coalesced in my mind as I was trying to come up with ideas. 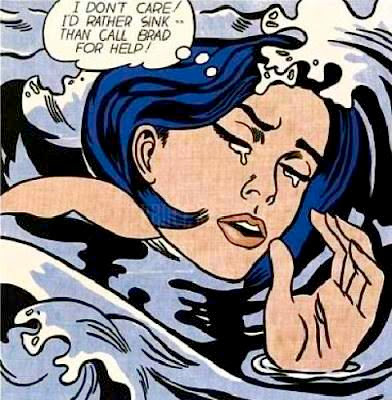 This cartoon is obviously a take off of Lichtenstein’s “Drowning Girl“. I have done a couple of cartoons now on Mr Licht, always avoiding the obvious dots angle. Actually if I could think of a dot joke that got more than a groan I’d be rushing to the drawing board. In this cartoon I like the thought that there could have been a “High Art” as opposed to popular culture back in cave man times. Perhaps there was. Maybe the stuff we dig up or stumble upon is just the rubbish and they made their greatest works of art out of paper.